The dive sites surrounding Koh Lanta truly have something to offer everyone. From secluded to lagoons to the deepest drop off in Thailand - Koh Lanta has something amazing to offer for all levels of diving & snorkelling. Find out more on our famous dive sites below. Koh Haa to the west is our closest collection of Dive Sites - taking us just a little over an hour to reach due to our southerly departure point in Klong Nin. Koh Haa is a group of 5 islets suitable for both diving and snorkeling. This area is home to about 12 great dive sites, and it is quite common to experience 30m+ visibility here. A beautiful lagoon area is perfect for first-time diving and courses, where you can see anything from ornate ghost-pipefish and harlequin shrimps to turtles, barracudas and even Whalesharks. More experienced divers can experience deeper sites, undersea caverns and stunning swim-throughs - the most famous being the 'cathedral' at Koh Haa Yai - where the huge cave entrances make it possible to enter without lights, and even surface inside the island where beautiful limestone formations form a 'cathedral' like ambiance. Suitable for: Beginners, Advanced Divers, Snorkelling, Free Diving. Hin Daeng (red rock) and Hin Muang (purple rock) are two world-famous dive sites located within 100 metres of one another are known for their stunningly beautiful soft corals and for having some of the deepest drop-offs in Thailand. Located 50 km from Koh Lanta, these dive sites are a must-see for experienced divers. Being the lone outcrops on a 70m seabed, they are home to an amazing variety of pelagic life. Schooling tunas and trevally hunt beside rainbow runners and barracuda. A wide diversity of macro-organisms on the reef will try to distract you from the beautiful manta rays that often circle overhead. The Hin Daeng & Hin Muang dive sites are often regarded as some of the best that Thailand, if not the world has to offer. Due to their remote nature, it takes us approximately 2.5 - 3 hours to reach these sites. Suitable for: Advanced Divers only. Located a stones throw from the Phi Phi islands - Koh Bida gives the opportunity to admire beautiful gorgonian sea fans, and is a favoured spot to see leopard sharks nestling on the sand or black tip reef sharks patrolling the shallower reefs. 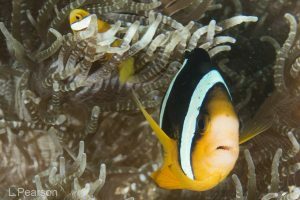 Koh Bida Nai & Koh Bida Nok offer spectacular reef diving in the lagoon areas, swim throughs and wall diving can all be found here. Hin Bida a short journey away is a completely submerged reef - here you are likely to find huge numbers of schooling fish & maybe a whaleshark! Suitable for: Beginners, Advanced Divers..
Around 2 hours away from Koh Lanta lies the beautiful scenic islands of Koh Rok. Koh Rok is most famous for it's beaches and snorkeling, but also offers diving around its two islands. Shallower than the other dive sites, it hosts a wide variety of coral formations & reef creatures. Turtles, Moray eels, and big red octopuses can be found hidden among the coral gardens. Suitable for: All Diver levels, Snorkelling, Free diving.